I don't believe v6 is considered obsolete ... yet. The only recommendation re v6 is that you use the latest version 6.34. That way you'll have access to a4 projects that currently come with a 10% bonus over and above the current Quick Return Bonus that you get by using a passkey. There are a number of features in v7 that can improve throughput. One is that the next WU can be downloaded and ready for processing before you finish the current WU and start processing while the current WU is being uploaded. Another is that v7 clients (FAHClient) on different computers can communicate with FAHControl running on your main computer so that you can monitor and control the clients on all the computers being used without actually having to physically go to those other computers. Also, some projects are specifically set up to only run on v7 so you'll never get them if you're using v6. That may not always be a bad thing if the projects using v6 produce more than the current v7-only projects but it could be the other way around. My know-how on folding is a billionth of bollix47's. Anyway, I can tell you I use a three-year-old dual-core desktop with Windows 7. I changed F@H 6 to F@H 7 four months ago, and got more points than before. And let us suppose more points are better for science. I am satisfied with F@H 7. No delays, no WU corruption. I only quit it when installing a large program or performing any other heavy CPU task. By the way, if F@H 7 were very harmful, would it be the default download? Thanks bollix47 and cesarsalgado! Sorry about the delay in responding--I have been in transition and setting up a new place. Where are my priorities?! BTW, cesarsalgado, when you said, "I only quit it when installing a large program or performing any other heavy CPU task," is that because the V7 client takes more memory/CPU than V6, or because you are getting larger work units? If I "quit it when installing a large program or performing any other heavy CPU task" it is only because installing some software I saw my desktop in trouble. Sorry that my PC knowledge is not much: that trouble may well have been caused by the avast! antivirus or any Windows stuff, or even hardware. Also, I run F@H with 100% CPU usage, which is the default: I suppose changing that could have helped. Anyway, my usual needs do not conflict with F@H: surfing the web, watching music videos, reading, writing... About larger work units, the largest I received took my PC some eighty hours to complete. Now receiving several twelve-hour WUs. I think servers somehow adjust WUs to each client. It's always the quiet ones you have to watch for. Also will it grossly impact my system performance if i start folding ? Can i watch HD quality videos while folding? About watching HD videos, it depends on your system specs, but also you can configure the client CPU usage percentage... and do more tweaks other people here and there may tell you better than me. Rank (including team 0 and Google team) = 30 out of 86,262 active teams. Points = 1,342,031,202 (+65,013,796), Units = 621,412 (+9,834). There are 692 members in the team, 27 of whom were active this month (4%). Great team news is that MozillaZine has passed 1,300,000,000 points this month - fantastic! There are some great results in the full stats this month. For example, Peter_Baerwald passed 7,000,000 points, ObWanMich passed 900,000 points, Timoleon and damoochie passed 700,000 points and Cesar_Salgado passed 500,000 points. For work units, sleewa completed 2,000 WUs and ston8123 completed 60 WUs. Well done!! As always, many thanks to everyone for all of your valuable contributions. P.S. Sorry I got a bit behind with these! You can try and make a system foolproof but fools can be very ingenious! Rank (including team 0 and Google team) = 27 out of 86,529 active teams. Points = 1,401,216,991 (+59,185,789), Units = 634,847 (+13,435). There are 692 members in the team, 25 of whom were active this month (4%). Great team news is that MozillaZine is up 3 places this month to position 27! Also great news is that MozillaZine has passed 1,400,000,000 points this month - fantastic! There are even more great results in the full stats this month. For example, kennish passed 900,000,000 points, RAF_Moz_work passed 50,000,000 points, Peter_Baerwald passed 8,000,000 points, larryb_home passed 7,000,000 points, new08 passed 3,000,000 points, Timoleon passed 800,000 points, Loudnoise passed 700,000 points and ston8123 passed 90,000 points. For work units, kennish completed 170,000 WUs, RAF_Moz_work completed 70,000 WUs, Timoleon completed 2,000 WUs and ston8123 completed 70 WUs. Well done!! Rank (including team 0 and Google team) = 27 out of 86,800 active teams. Points = 1,462,832,443 (+61,615,452), Units = 649,483 (+14,636). There are 693 members in the team, 26 of whom were active this month (4%). First, welcome to new member: Ronald_Tilby_. There are some great results in the full stats this month. For example, Peter_Baerwald passed 9,000,000 points, DrBB1 passed 1,500,000 points, Timoleon passed 1,000,000 points, Loudnoise passed 800,000 points, Cesar_Salgado passed 600,000 points, RPGMaker35 and Ronald_Tilby passed 500,000 points and ston8123 passed 100,000 points. For work units, kennish completed 180,000 WUs, bollix47 completed 100,000 WUs, damoochie completed 3,000 WUs and ston8123 completed 80 WUs. Well done!! Rank (including team 0 and Google team) = 27 out of 87,036 active teams. Points = 1,528,614,951 (+65,782,508), Units = 664,088 (+14,605). There are 694 members in the team, 25 of whom were active this month (4%). First, welcome to new member: Mori. Great team news is that MozillaZine has passed 1,500,000,000 points this month - fantastic! There are some great results in the full stats this month. For example, kennish passed 1,000,000,000 points, larryb_home passed 8,000,000 points, ObWanMich passed 1,000,000 points, damoochie passed 800,000 points, Ronald_Tilby passed 600,000 points and Mori passed 1,000 points. For work units, new08 completed 7,000 WUs and ston8123 completed 90 WUs. Well done!! Rank (including team 0 and Google team) = 26 out of 87,195 active teams. Points = 1,589,783,244 (+61,168,293), Units = 676,790 (+12,702). There are 694 members in the team, 27 of whom were active this month (4%). Great team news is that MozillaZine is up 1 place this month to position 26! There are even more great results in the full stats this month. For example, bollix47 passed 400,000,000 points, Peter_Baerwald passed 10,000,000 points, larryb_home passed 9,000,000 points, new08 passed 4,000,000 points, DrBB1 passed 2,000,000 points, Timoleon passed 1,500,000 points, jcall passed 1,000,000 points and Ronald_Tilby passed 700,000 points. For work units, kennish completed 190,000 WUs, ston8123 completed 100 WUs and Mori completed 50 WUs. Well done!! Points = 1,589,783,244 (+719,211,857), Units = 676,790 (+134,812). There are 694 members in the team, 47 of whom were active this year (7%). First, welcome to new members: robodesign, Mori, Ronald_Tilby_, 7Michael1, Peter_Baewald, Sasha_van_den_heetkamp, puzzler, candypopgames.com, TedBenic, Wong and bungbung. Great team news is that MozillaZine is up 9 places this year to position 26! 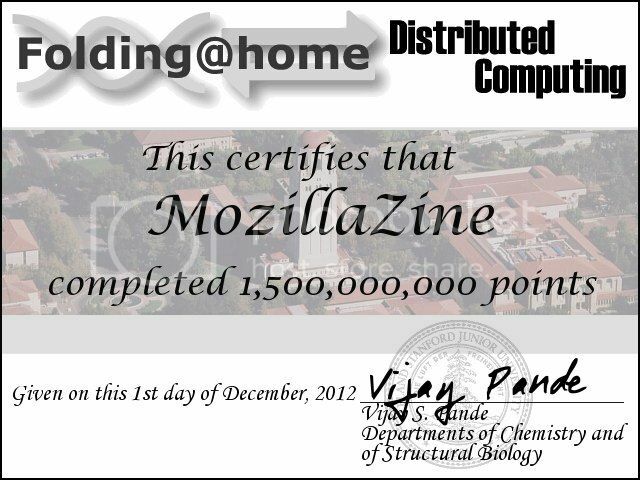 Also great news is that MozillaZine has passed 1,500,000,000 points this year - fantastic! There are even more great results in the full stats this year. For example, kennish passed 1,000,000,000 points, bollix47 passed 400,000,000 points, RAF_Moz_work passed 50,000,000 points, Peter_Baerwald passed 10,000,000 points, larryb_home passed 9,000,000 points, new08 passed 4,000,000 points, DrBB1 passed 2,000,000 points, Timoleon, ObWanMich and jcall passed 1,000,000 points, Loudnoise and damoochie passed 800,000 points, Ronald_Tilby passed 700,000 points, Cesar_Salgado passed 600,000 points, RPGMaker35 passed 500,000 points, sergio_eduardo and sunilonln passed 300,000 points, JesseHathaway passed 200,000 points and ston8123 and robodesign passed 100,000 points. For work units, kennish completed 190,000 WUs, bollix47 completed 100,000 WUs, RAF_Moz_work completed 70,000 WUs, Peter_Baerwald completed 10,000 WUs, new08 and jcall completed 7,000 WUs, DrBB1 and ObWanMich completed 5,000 WUs, Loudnoise and damoochie completed 3,000 WUs, Timoleon, sleewa, Ronald_Tilby, RPGMaker35 and sergio_eduardo completed 2,000 WUs, JesseHathaway and Anonymous_2 completed 900 WUs and ston8123 and robodesign completed 100 WUs. Well done! !